Yesterday, Bud Selig announced Major League Baseballs plans to expand instant replay, beginning with next years postseason. The new process will include challenges from managers, similar to the NFL’s replay system. MLB hopes this new expansion plan will prevent any bad calls from costing teams games and will ultimately take some of the umpire human error out of the game. Managers will now be given three challenges to be used per game. One can be used in the first six innings and the final two can be used from the seventh inning to the completion of the game. Challenges that are not used in the first six innings of a game WILL NOT carry over to the later innings. The home run review process that is currently in place will be carried over into the new system. I know what you’re thinking, isn’t this just going to make baseball games even longer? Well MLB has apparently taken care of that to ensure plays are reviewed in a timely manner. Calls that are challenged, will be reviewed by officials in the NYC head quarters, who will make the final ruling on a given play. Replays currently take just over 3 minutes and this new system will reportedly take just over a minute to keep the pace of play moving. The replay committee, which consists of Joe Torre, Tony La Russa and John Schuerholz, have been in charge of working out the details and relaying the message to all parties involved. Schuerholz said that 89% of wrong calls made will become reviewable and that umpires have been very receptive to the proposal. Joe Torre, gave a presentation to representatives from all 30 teams over the past two days and Torre felt it was well received all around. The timing of all of this seems a bit odd to me. There have been rumblings for quite some time about replay expansion coming, but why the rush to announce this now? I don’t know if this was Selig’s way of taking some attention off of the Biogensis scandal or if it was to put media pressure on all parties to approve it. Whatever the reason was, he came off very deceptive, acting as if this was an official announcement and not a proposed plan that it truly is. Owner’s will surely vote yes for this, as this will undoubtedly help improve their product on the field. I know players will have mixed feelings regarding the matter, but I think they will ultimately end of voting yes to the replay expansion. But if there is one thing they don’t like, its being bullied around. 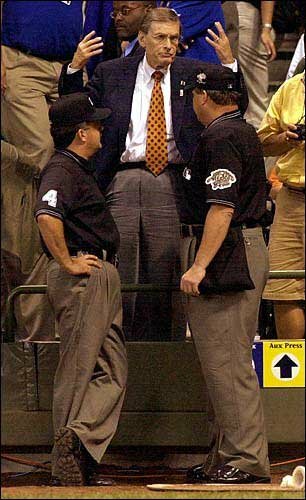 Selig should not have taken center stage calling a proposed plan a “historic moment” before anything is finalized. Like it or not, it appears America’s Favorite Past Time is headed for some major changes. The game will lose some of its authentic feel, but do people even care anymore? Baseball purist are far and few between these days, as changes like this cater to the casual fan. It’s a sad day for fans like myself, who never want to see this great game changed, but for others, they are saying it’s about time.